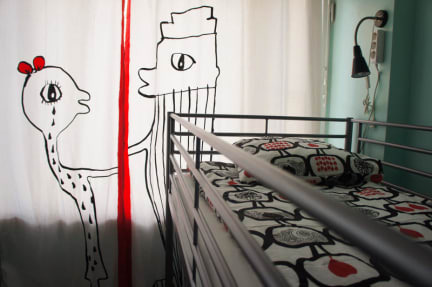 SweetDream Guesthouse is a comfortable and cozy accommodation which located in the central area of Helsinki. The convenient condition of public transportation is a great advantage. Bus stop, tram and Metro stations are all in 150m away from us. You can easily travel to city center, scenic spots, airport and harbor. There are a 24h supermarket nearby and also an on-site restaurant. Each room has excellent city view and each bed has its own electric sockets and head light. The common area will create a great opportunities to exchange your traveling experience. Our electronic key-car system makes you check-out super easy. The convenient public transportation is a great advantage of us. Bus stop, tram and Metro stations are all in 150m away from us. You can easily travel to city center, scenic spots, airport and harbor. By taking the public transport, it only uses 5 min to city center and 30 min to Vantaa airport and harbor. Please inform us before-hand, if you arrive after 20:00. We will sent the door code and check-in instructions via e-mail. Cancellation policy: 48 hours before arrival date. We do not accept customers younger than 12year years of age. Fantastic place that warmly accommodated us even with phone issues and late check in. Our lockers were all secure RFID/keycard access so we felt very safe leaving our things there. There are 2 clean, well kept toilets and showers with good temperature and high water pressure. there is even a sauna, a computer we could use, WIFI and a balcony with a bench and a clothes hanger. located right next to a 24 store and bus routes. great value, would absolutely come again. Not a party hostel.Can have a good sleep. The place is quite and comfortable. I would 100% come back here. I had a very bad first experience in Helsinki but the reception girl went out of her way to make my stay great and find a way for me to love the city. It’s a little hard to find but worth it. I loved staying here! Me and my friends were able to have a room to ourselves without paying any extra. Beds were super clean and comfy, shower was large and had product in it for us to use, place was clean and quiet. Everyone who worked here was sweet and accommodating. Had a sauna and a terrace for guest use. Overall a great stay, would highly recommend to anyone looking to stay in Finland! This place is true to its name as it's quiet cozy and feels very homely. It's not as big as I pictured and I would've preferred it to be a bit cleaner (the fridge and the bathrooms could've been better but it was fine), but I got used to it over the course of my stay and ended up being quite nice. It's about a 20-30 minute walk to the city but about a 7 minute tram. The best part of this place was the staff, as they were extremely kind, helpful and welcoming to me. 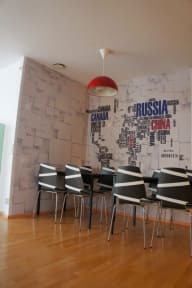 Helsinki is an expensive city to stay in so this hostel was a budget friendly option comparatively. The hostel itself was on the smaller side but had everything needed for your stay. The facilities were cleaned every day by staff and they were great at suggesting places to go and answering any questions. Common areas were not really as big (a few couches at the entrance) and neither were the rooms so I'd recommend this hostel just for sleeping and going out all day to adventure then return. Good little hostel in Kallio district, facilities and staff are great, solid location. Only downside was there was pretty much zero atmosphere - no noise allowed after 11pm and a lot of people kept to themselves, but part of that is probably due to it being low season so the hostel was mostly empty. Low rating but they had a sauna which is great. Nothing special. Just not so expensive accomodation. Be prepared having your own towel, because it is for rent only. Also the schedule of sauna is quite strange, from 10.00 to 20.00, when tourists are out.